An SOS call brings the Doctor and his glamorous assistant to the Generios system, to “do battle” with the terrifying Skelloids. Putting down the faked alien invasion is a piece of cake, and they’re just arranging for the bank transfer of reward funds, when a massive cylinder appears over the planet and demands tribute. And if that wasn’t bad enough, the real Doctor and Mel turn up at the same time. Normally there’s only room for one doctor, but this time, two heads are going to have to be better than one…. Warning: contains Christopher Biggins and Matt Lucas. And Adam Buxton. But, dare I say it, none of them overshadow the storyline, and none of them spoil the pace – because this is a darned pacey tale, and is so lightly written and well-balanced that it effortlessly puts the comedy stars in their places. You can tell that the writers not only love Doctor Who but love the Sixth Doctor too – the script is packed with one-liners and knowing self-mocking in-jokes: for example, there’s a quip about how nobody wants to just listen to things, they want visuals too…. 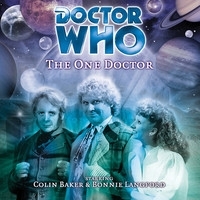 and the verbal jousting between The Doctor and Biggins’s character Banto Zame is a high riot (“Oh here we go another voyage around the English language!”). Gareth Roberts has form, of course – he wrote The Romance of Crime and The English Way of Death for the Fourth Doctor in the Virgin Missing Adventures range, both highly regarded and now also available as full cast plays. Somehow he manages to combine a nightmarish trip to Ikea, a never-ending game of The Weakest Link (years before Nu-Who did it), and an encounter with a horrendously long-lived Jelloid treasure guard (that’s Matt Lucas) and still not lose track of the main plot. The very idea of “the vulgar end of time” is wonderful, and it’s ideas like that which make the story worth repeat listens. The looming cylinder of death provides the impetus for the new dysfunctional Tardis team to get their act together, bickering and making declarations of undying love all the while. I was laughing all the way down the street. The neighbours were probably wondering what I was taking. And that’s an important point to make – as blogger and reviewer Joe Ford (“Doc Oho”) says, it’s far easier to scare people than it is to make them laugh and The One Doctor makes you really laugh. Some of Big Finish’s finest moments have been proper tense dramas, true, but The One Doctor is a masterclass of comedy as well as having the requisite ticking clock on the wall. It’s like a Tardis version of Galaxy Quest in many respects, escpecially in how it treats its subject. You’re laughing with them, not at them, if you know what I mean. Another essential listen, then. Trust me, you won’t regret picking this one up.